12000 rub. 14000 rub. 15000 rub. St. Petersburg is located on forty two islands of the delta of the Neva. The city is crisscrossed by more than ninety rivers, distributaries and canals arched over by as many as five hundred bridges. It became home for the largest Russia's passenger and commercial port on the Baltic Sea. The founder of the city Peter the Great was dreaming to create a European-looking city and supposed that it would be viewed from the water, like Amsterdam, Venice, Stockholm or London. 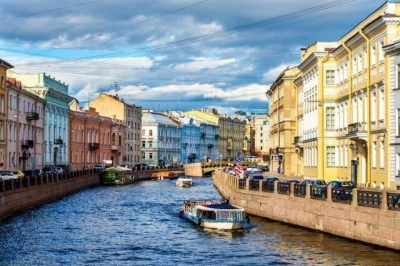 It's no coincidence that the main city structures, including the Romanovs' residences and the palaces of the nobility were built on the embankments of the rivers and canals. There is no space between the buildings that are standing in one row, which makes an illusion of a continuous facade reflected in water. The main city's tourist attractions are placed along the Neva river banks: the Summer Gardens, the Winter Palace, the Peter and Paul Fortress, the Admiralty, the Academy of Science, the Senate and Synod buildings — no wonder why it's called St. Petersburg's thoroughfare. There are 13 draw bridges across the Neva and its tributaries, which open at night according to a special timetable. During the white nights season thousands of tourists come to the centre to see this spectacular performance. It's hard to believe that Peter the Great prohibited to construct bridges and it was possible to cross the Neva in the early 18th century only by boat. More than 300 years have passed, and Peter the Great's dream has come true: the best view on magnificent embankments of St. Petersburg opens from water. During the boat trip you will be able to see more than thirty bridges, to sail along the Neva, the Fontanka, the Moika, the Kruykov canal and to enjoy the best city sights. We providing private guided St. Petersburg River Cruise in English, German and other languages.